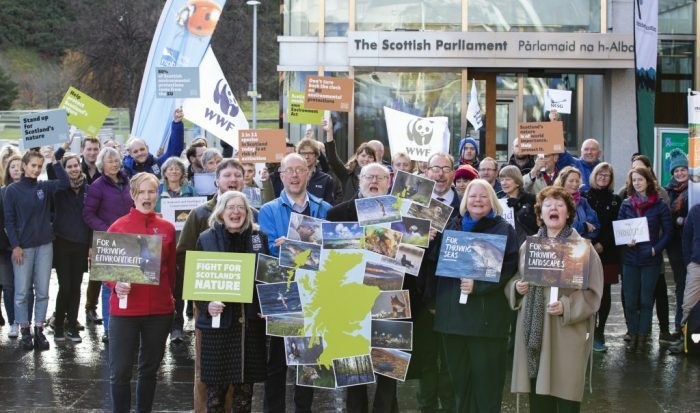 Scottish Environment LINK, a coalition of Scotland’s leading environmental charities have launched an urgent campaign, “Fight for Scotland’s Nature” at the Scottish Parliament. Together they call for Scotland to have its own environment act. Fears sparked by Brexit as well as mounting evidence of the global ecological crisis also heavily impacting Scotland has prompted the charities to join forces and urge the Scottish Government to commit to a dedicated Environment Act for Scotland that protects and enhances Scotland’s nature, now and in the future. 80% of all Scotland’s environmental laws come from the EU. The combination of strong legislation and support for effective implementation has made these laws among the most effective on Earth. Further, Scotland’s nature has been a net beneficiary of the EU’s LIFE Nature fund which alone has supported conservation projects worth well over 25 million Euros to date. If and when Brexit happens, Scotland (along with the rest of the UK) will lose the unrivalled support and enforcement roles of the European Commission, European Court of Justice and other EU bodies. Alarmingly, with only four and a half months to go, there is uncertainty about what will replace this. This is why Scottish Environment LINK is pushing the Scottish Government to fight for Scotland’s nature and commit to a world class environment act before it’s too late. Ahead of global 2020 targets on halting biodiversity loss, it is important that Scotland sends a clear message to the world that our environmental protections are not up for grabs. Joined up legislation in the form of a Scottish Environment Act, that is fit for purpose and caters to Scotland’s unique environmental needs, is required for this to be meaningful. Scotland may be small but its natural environment is of world importance. It has 60% of the UK’s seas and 10% of Europe’s coastline. It is home to a staggering one third of all of Europe’s breeding seabirds and 29% of Europe’s seals. Its coral reefs, thought to be around 4,000 years old, support an incredible array of life, including fish, sharks and invertebrates. As for peatlands, Scotland has 5% of the world’s share, which stores 25 times more carbon than all the vegetation of the UK. Scottish Environment LINK is stressing the importance of Scotland continuing to develop protections in line with internationally recognised EU environmental principles that have been crucial in safeguarding Scotland’s nature and enabling it to thrive. It also warns of the dangers of inadequate support and funding to effectively implement laws. Further, it is pushing for clear environmental targets supported by long-term actions and funding to mitigate climate change, create robust ecosystems and ensure sustainable use of our natural resources that is good for us and our land and seas. For more information about Scottish Environment LINK’s, Fight for Scotland’s Nature Campaign visit www.fightforscotlandsnature.scot. This article was originally published as Scottish Environmental Charities Launch Urgent Bid for an Environment Act for Scotland at Fight For Scotland’s Nature (Scottish Environment LINK) on 13/11/18.